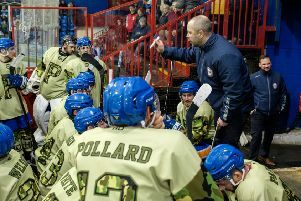 Coach Slava Koulikov refused to write off Peterborough Phantoms’ title hopes in the wake of a blank weekend. The city team suffered back-to-back defeats as a 4-3 reverse in Swindon on Saturday night (February 20) was followed by a 5-3 loss on home ice at the hands of reigning champions Telford last night (February 21). The double-blow has left Phantoms, who remain second, eight points behind leaders Basingstoke with only eight games to go, but Koulikov is in no mood to give up on the championship crown. Koulikov said: “We’re at the stage of the season where we need points and it is obviously disappointing to come out of a weekend with nothing. “Our performance in Swindon wasn’t that great, but I felt it was there against Telford. “We haven’t thought about the title all season. We’ve just concentrated on one game at a time and we’ll continue to do that. “Of course the fact we lost two games in a row makes things easier for Basingstoke who have seen their lead over us double during the weekend, but we have a couple of games in hand and they still have tough games to play. Despite Koulikov’s upbeat assessment, Phantoms looked short of their best agains ruthless Telford last night. They fell behind when Dan Davies made the only breakthrough of the opening period before most of the action and all of the controversy arrived in an incident-packed second period courtesy of six goals and several hotly-disputed decisions – or lack of – from official Stefan Hogarth. Both netminders conceded a third of the shots they faced – four from 12 in under seven minutes in the case of Phantoms’ Janis Auzins and two from six for Tigers goalie Thomas Murdy. Phantoms levelled through Craig Scott early in the period but they were soon trailing again when Tigers import Blahoslav Novak stylishly beat Auzins in a one-on-one situation. The goal was allowed to stand even though the Phantoms net had been knocked off its moorings in a previous attack moments earlier and the puck was back in the net only nine seconds later when a rising Jason Silverthorn shot took Auzins by surprise at his near post. Auzins then paid the price for an outburst at Hogarth after having his helmet damaged by a stray stick while making a save. His verbal volley at the official earned an unsportsmanlike conduct penalty which was compounded when Phil Hill slammed in the visitors’ fourth on the subsequent powerplay. And the Tigers soon struck again with another helping hand from Hogarth as he and his linesman missed the clearest of offsides in the build up to Andrei Makrov’s smart finish. Darius Pliskauskas did at least provide a response within seconds of that goal, but a frustrated set of Phantoms never looked like scaling the mountain they had left themselves to climb. Auzins continued to fight a running battle with the abject Hogarth, who missed a blatant check to the head of Robbie Ferrara and Tom Norton being dragged to the ice in a matter of minutes. However, he did spot Auzins’ sarcastic applause following the second of those incidents and handed him a 10-minute misconduct penalty – a rather pointless show of officiousness which served only to further rile the home team and their supporters. Marc Levers thought he had reduced Phantoms’ arrears early in the final period only for Hogarth to deem Murdy had sat on the puck before it could cross the line. They had to wait until the closing stages to add to their tally when Edgars Bebris struck after Auzins had been pulled, but there was no fairytale finish to a weekend to forget. Koulikov added: “We battled hard in every area of the ice and just conceded one or two goals too many in the second period. Phantoms were again without injured import Ales Padelek, who has been hospitalised with an elbow problem. Defenceman Jason Buckman also sat our the Telford clash. Phantoms travel to fierce rivals Milton Keynes on Saturday (February 27) for their only fixture of next weekend.